The memorial is to be found in the parish church of St Michael's, Steeple Claydon. 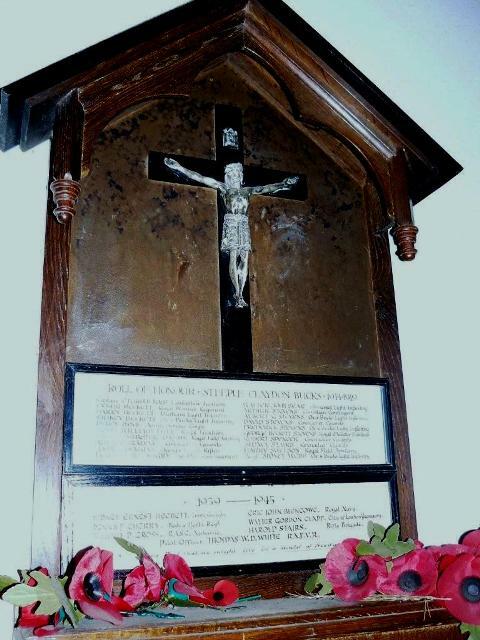 It takes the form of a wooden board with a triangular cowling with an image of Christ being crucified and below this two plaques, the first with a Roll of Honour for World War 1 (20 names) and the second with the Roll of Honour for World War 2 (7 names). A further two plaques exist with different names on each for World War 2. The upper plaque contains the same names as the Roll of Honour but the lower plaque differs. 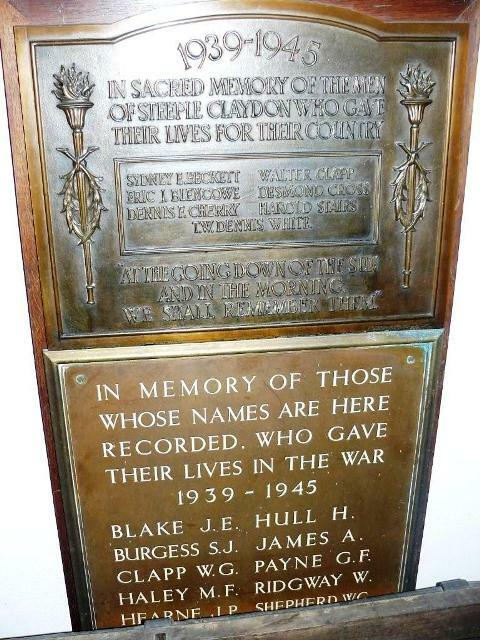 The third plaque with just surname and initials for World War 2 was moved to Steeple Claydon Church from Calvert brickworks, before the towers there were demolished, and the names are those of the fallen from the brickworks. Captain, 3rd Battalion attached 2nd Battalion, Lancashire Fusiliers. Killed in action 26 August 1914. Aged 24. Son of the Rev. Charles and Annie Bass, of Steeple Claydon Vicarage, Bucks. In the 1891 census he was aged 1, born Surrey, son of Charles and Annie Bass, resident Cambridge Road, Lee, Lewisham, London & Kent. In the 1911 census he was aged 21, born Streatham, Surrey, living on Private means, resident The Vicarage, Steeple Claydon, Buckinghamshire. Buried in NAVES COMMUNAL CEMETERY EXTENSION, Nord, France. Plot III. Row E. Grave 9. CAPTAIN CHARLES HAROLD BASS, 3rd BATTN. LANCASHIRE FUSILIERS, who was stated in the Casualty List issued by the War Office in May, 1915, to have been "un-officially reported killed or died of wounds," was the only child of the Rev. Charles and Annie Bass, Steeple Claydon Vicarage, Bucks. 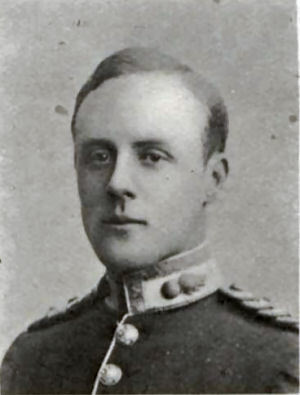 Captain Bass, who was 24 years of age at the time of his death, was educated at Cranleigh School, Surrey, where he was a member of the Officers' Training Corps. He joined the Special Reserve of Officers in 1908, and received his commission in the Lancashire Fusiliers in May, 1909, becoming Lieutenant in 1911. He was gazetted Captain in January, 1915. He was wounded on the 26th August, 1914, during the retirement from Mons, four days after his battalion landed in France. No news of him could be obtained until his identity disc was received, in March, 1915, from the American Ambassador in London. It appears that a British Sergeant, who was a prisoner of war at Döberitz, had given it to his Camp Commandant, who in his turn forwarded it to the Ambassador in Berlin. Later, a postcard was received from a Corporal of the Lancashire Fusiliers, a prisoner at Döberitz, saying "Lieutenant Bass is dead." From the same source it has since been ascertained that Captain Bass was wounded in the Battle of Cambrai on August 26th, 1914. died of wounds the same day, and was buried in a churchyard, together with Lieutenant-Colonel Dykes, of the King's Own Regiment, and Lance-Corporal Sturgess, of the Essex Regiment. The writer adds :—"There was also a Captain of our regiment buried there, and I know it was not Captain Sidebottom, because he was buried in the same trench where he fell." A superior officer wrote to Captain Bass's friends :—"I cannot find words to say all I should like ; but this I can say, that Harold's example, whether in his life or his death, will be to me a great help. Those of us who knew and loved him realise what an example such a life as his can be." A former schoolfellow and friend writes from Ceylon :—"I always valued Harold's friendship, and I valued it especially because he was, to my mind, a splendid type of a God-fearing man, both mentally and physically." Another friend in the regiment, when writing after Captain Bass was wounded, said :—"It is very hard luck that he has been wounded before he had time to show what a fine officer he was." [Memorial states Royal Warwickshire Regiment] Private 23049, 4th Battalion, Worcestershire Regiment. Killed in action at Gallipoli 6 August 1915. Aged 19. Born and resident Steeple Claydon, enlisted Buckignham. Son of Charles Beckett, of Vicarage Lane, Steeple Claydon, Bucks. No known grave. Commemorated at HELLES MEMORIAL, Turkey (including Gallipoli). Panel 104 to 113. Corporal 14473, 15th Battalion, Durham Light Infantry. Reported mssing presumed killed in action 16 September 1916. Born Winslow, enlisted Sunderland, resident Claydon. Son of Joseph and B. Beckett, of 26 West Street, Steeple Claydon. Attested 7 September 1914 in Sunerland, aged 22 years 8 months, born Steeple Claydon, Winslow, Buckinghamshire, Plate Layer by trade, height 5 feet 6¾ inches, weight 140lbs, chest 36 inches, fresh complexion, grey eyes, dark brown hair. Posted 14th Battalion 17 September 1914. appointed Lance Corporal 14th Battalion 6 November 1915, posted Depot 24 December 1915, posted 16th Battalion 5 February 1916, officially appointed Lance Corporal 5 February 1916, posted 15th Battalion 2 June 1916, appointed Acting Corporal 15th Battalion 1 July 1916, promoted Corporal 3 July 1916. Suffered gas Poisoningf, dangerously ill in France 21 December 1915. No known grave. Commemorated at THIEPVAL MEMORIAL, Somme, France. Pier and Face 14 A and 15 C.
Private 11834, 6th Battalion, Oxfordshire & Buckinghamshire Light Infantry. Killed in action 5 March 1916. Born Claydon, enlisted Oxford, resident Steeple Claydon. Buried in Buried at ESSEX FARM CEMETERY, West-Vlaanderen, Belgium. Plot I. Row I. Grave 7. Driver T4/214301, 490th Company, Army Service Corps. Died 13 November 1918. Aged 29. Son of Benjamin and Elizabeth Inns; husband of Beatrice Clarisa Inns, of "Payneham," Steeple Claydon. Buried in the north-east part of STEEPLE CLAYDON (ST. MICHAEL) CHURCHYARD, Buckinghamshire. Major, "A" Battery, 46th Brigade, Royal Field Artillery. Died of wounds 2 December 1917. Aged 30. Only son of Florence and the late Hugh Dunbar McMaster First joined 48th Brigade in 1907, at Dundalk; Ireland. Seriously wounded in 1914 and in 1916. Awarded the Distinguished Service Order (D.S.O.) and Military Cross (M.C.). Buried in WIMEREUX COMMUNAL CEMETERY, Pas de Calais, France. Plot IV. Row J. Grave 2. McMASTER, HUGH, D.S.O., Major, Royal Field Artillery, only s. of the late Hugh Dunbar McMaster, J.P., of co. Down, by his wife, Florence, dau. of the late Major-General George Harper Saxton, Madras Stall Corps; b. Gilford. co. Down, 11 March, 1887; educ. Tyttenhanger Lodge; Rugby, and Royal Military College, Woolwich ; gazetted 2nd Lieut. Royal Field Artillery July, 1907; promoted Lieut., Capt.- October, 1914, Acting Major in 1916, and Major July, 1917; served with the Expeditionary Force in France and Flanders front the beginning of Aug. 1914; was severely wounded at Braisne, on the Aisne, 1) Sept. following ; on recovery returned to France. and was again wounded Sept. 1916, and died at Boulogne Hospital 2 Dec. 1917, front severe wounds received in action at Grafenstafel, near Passchendaele, on the 29th of the previous month. Buried at Wimereux. His Brigadier-General wrote: "I feel very deeply the loss to his battery and to the country of one of the very finest types of officer I have ever met. He has always shown the most extraordinary devotion to duty," and another officer: "The greatest loss the Royal Regt. has had in this war." Another also wrote: "He was the model of efficiency—noted for his energy, determination and firmness in command of men—yet full of sympathy, kindness, and ever ready to do anything for the welfare of his battery." Major McMaster was three times mentioned in Despatches (London Gazettes, 15 June, 1916 ; 15 May, and 14 Dec. 1917) by F.M. Sir Douglas Haig, for gallant and distinguished service in the field. He was awarded the D.S.O. (London Gazette. 31 Dec. 1917), for gallant and distinguished service in the field, and the M.C.. for gallantry and devotion to duty. Major McMaster was an enthusiastic sportsman, particularly keen on hunting, steeplechasing and yachting ; unm. McMASTER, H. (D.S.O. L.G. 1.1.18); b. 11.3.87 ; s. of H. D. McMaster J.P., and Florence McMaster; d. of Major-General Saxton; educ. at Tyttenhanger Lodge; at Rugby; R.M.A., Woolwich; entered R.F.A., July, 1907; Capt., Oct. 1914; Major, July, 1917; served Europ. War; proceeded to Belgium, Aug. 1914; took part in the Retreat from Mons; was severely wounded in the subsequent advance on 15.9.14; then trained a new battery and went out in command of it in May, 1915; was again seriously wounded on 15.9.16, and was fatally wounded on 29.11.17, dying of his wounds on 2.12.17; Despatches several times; M.C. [Spelt Aleck on SDGW & CWGC] Guardsman 24262, 4th Battalion, Grenadier Guards. Killed in action 1 December 1917. Aged 19. Born Steeple Claydon, enlisted Ealing. Son of Mrs. N. Paradine, of 56, Queen Catherine Rd., Steeple Claydon, Bucks. No known grave. Commemorated on CAMBRAI MEMORIAL, LOUVERVAL, Nord, France. Panel 2. [Listed as Lieutenant on memorial] Sergeant PS/757, 16th Battalion, Duke Of Cambridge's Own (Middlesex Regiment). Killed in action 9 October 1917. Born and resident Steeple Claydon, enlisted London. No known grave. Commemorated at TYNE COT MEMORIAL, West-Vlaanderen, Belgium. Panel 113 to 115. Private 50611, 1st Battalion, Prince Albert's (Somerset Light Infantry). Died 20th November 1918. Aged 21. Born and resident Steeple Claydon, enlisted Aylesbury. Son of William Sear. Buried in VALENCIENNES (ST. ROCH) COMMUNAL CEMETERY. Nord, France. Plot I. Row D. Grave 27. Private 18920, 1st Battalion, Grenadier Guards. Killed in action 24 March 1916.Born Grenborough, Bucks, enlisted Marylebone. Buried at BRANDHOEK MILITARY CEMETERY, West-Vlaanderen, Belgium. Plot I. Row J. Grave 2. Private 11710, 2nd Battalion, Oxfordshire & Buckinghamshire Light Infantry. Killed in action 16 May 1915. Aged 20. Born and resident Steeple Claydon, enlisted Buckingham. Son of Mrs Rebecca Stevens, of Chaloner Hill, Steeple Clayden, Bucks. Commemorated on LE TOURET MEMORIAL, Pas de Calais, France. Panel 26. Private 17280, 6th Battalion, Oxfordshire & Buckinghamshire Light Infantry. Killed in action 20 September 1917. Born and resident Steeple Claydon, enlisted Oxford. No known grave. Commemorated on TYNE COT MEMORIAL, West-Vlaanderen, Belgium. Panel 96 to 98. Private 20080, 2nd Battalion, Royal Munster Rifles. Died 13 February 1919. Aged 27. Son of Mrs. A. Stevens, of Bull Lane, Steeple Claydon, and the late Mr. W. Stevens; husband of Sarah May Stevens, of 86, Barking Rd., East Ham, London. Buried in the north-east part of STEEPLE CLAYDON (ST. MICHAEL) CHURCHYARD, Buckinghamshire. Private 109203, Labour Corps. Killed in action 18 June 1917. Aged 40. Born St. Neots, Huntingdonshire, enlisted Aylesbury, resident Steeple Claydon. Son of George and Angeline Swepson, of Peterborough; husband of Sarah Swepson, of 131, Oundle Rd., Woodston Peterborough. Formerly IL/332, 1st Labour Company, Royal irish Regiment and 162296, Royal Field Artillery. Buried in TILLOY BRITISH CEMETERY, TILLOY-LES-MOFFLAINES, Pas de Calais, France. Plot I. Row H. Grave 23. Sergeant 11832, 2nd/4th Battalion, Oxfordshire & Buckinghamshire Light Infantry. Died of wounds 15 November 1917. Aged 23. Born Claydon, enlisted Oxford, resident Steeple Claydon. Son of James and Fanny Webb, of North End, Steeple Claydon, Bucks. Buried in DUISANS BRITISH CEMETERY, ETRUN, Pas de Calais, France. Plot VI. Row D. Grave 31. Guardsman 2721400, 2nd Battalion, Irish Guards. Died of wounds 18 July 1944. Aged 24. Born and resident Buckinghamshire. Son of Joseph and Florence Beckett, of Steeple Claydon, Buckinghamshire. Buried in BAYEUX WAR CEMETERY, Calvados, France. Plot III. Row J. Grave 8. Stoker 2nd Class D/KX 527840, H.M.S. Lanka, Royal Navy. Died 12 February 1944. Son of Frank and Eliza Blencowe, of Steeple Claydon, Buckinghamshire. No known grave. Commemorated on PLYMOUTH NAVAL MEMORIAL, Devon. Panel 90, Column 2. [Frank Dennis CHERRY on CWGC and on Prinsore records a F CHERRY] Private 5951349, 5th Battalion, Bedfordshire & Hertfordshire Regiment. Died as a Japanese Prisoner of War working on the Burma-Thailand Railway 27 August 1943 of Dysentery and Malaria (Prisoner no. 4401); taken Pruionser at the fall of Singapore 15 february 1942. Aged 25. Born 1 February 1918, and resident, Buckinghamshire. Son of George and Ruth Cherry, of Steeple Claydon, Buckinghamshire. In the 1939 Register he was a Barker's Roundsman, unmarried, resident 2 Greenwood Place , Buckingham R.D., Buckinghamshire. Buried in KANCHANABURI WAR CEMETERY, Thailand. Plot 4. Row B. Grave 29. Driver T/14663327, 63 (Airborne) Division Comp. Company, Royal Army Service Corps. Presumed killed in action 19 September 1944. Aged 33. Born and resident Buckinghamshire. Son of Mr. and Mrs. F. E. Cross; husband of Alice Eleanor Cross, of Steeple Claydon, Buckinghamshire. No known grave. Commemorated at GROESBEEK MEMORIAL, Gelderland, Netherlands. Panel 9. [Listed as STAIRES in Army Records] Rifleman 11422412, 10th (2nd Bn. The Tower Hamlets Rifles) Battalion, Rifle Brigade. Killed in action 5 July 1944. Aged 28. Born and resident Buckinghamshire. Son of Christopher Stairs, and of Gertrude Stairs, of Steeple Claydon, Buckinghamshire. Buried in AREZZO WAR CEMETERY, Italy. Plot III. Row C. Grave 18. Pilot Officer (Navigator) 143874, 254 Squadron, Royal Air Force Volunteer Reserve. Died 17 February 1943. Aged 23. Son of Samuel and Beatrice Maud White, of Steeple Claydon. Buried in STEEPLE CLAYDON (ST. MICHAEL) CHURCHYARD, Buckinghamshire. "They died that we might live in a world of freedom"
These are the names of the men from the Calvert brickworks which was just down the road from the church. The Calvert Brickworks was opened in 1900 by Arthur Werner Itter, a brickmaker from the Peterborough area, and closed in 1991. Private 10592529, Royal Army Ordnance Corps. Died as a result of an accident 15 March 1945. Aged 37. Born Oxfordshire, resident Buckinghamshire. Son of Walter and Anne Blake; husband of Elsie Nellie Blake, of Twyford, Buckinghamshire. Buried in SCHOONSELHOF CEMETERY, Antwerpen, Belgium. Plot IV. Row B. Grave 1. Sergeant (Wireless Op./Air Gunner) 1313051, 49 Squadron, Royal Air Force Volunteer Reserve. Died 17 June 1943. Aged 21. Son of Thomas Frederick Haley, and of Doris Winifred Haley, of Winslow, Buckinghamshire. Buried in EINDHOVEN (WOENSEL) GENERAL CEMETERY, Noord-Brabant, Netherlands. Plot JJB. Joint grave 101-102. Ordinary Seaman P/JX 295077, H.M.S. Eagle, Royal Navy. Died 11 August 1942. Aged 21. Son of Joseph Humphrey James Hearne and Ann Emma Hearne, of Grendon Underwood, Buckinghamshire. No known grave. Commemorated on PORTSMOUTH NAVAL MEMORIAL, Hampshire. Panel 65, Column 3.